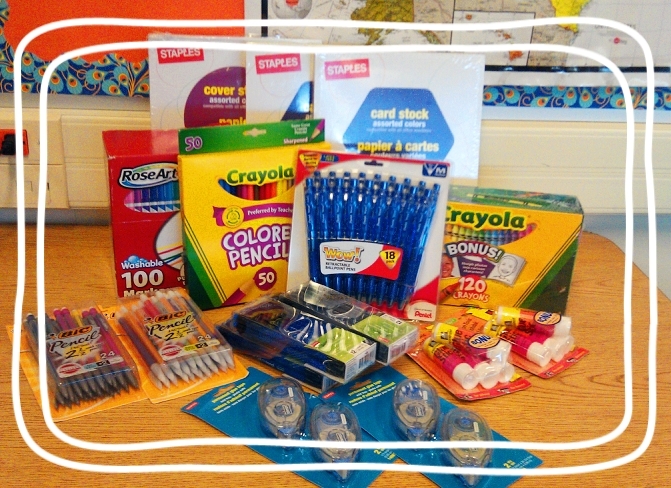 At the beginning of the school year, a friend of mine sent me a link to a Reddit project that matches teachers with people who are willing to donate specific classroom supplies. (The link I used unfortunately doesn’t work any longer, but I am assuming that Reddit will run this project again next school year and advertise it on their site). I wrote a list of the specific things that I always run out of or wish I had in my classroom. A super nice (anonymous) lady mailed me two boxes full of pencils, markers, card stock, glue, crayons, and colored paper. I was so touched, and so were my students! We used some of the supplies to make her a really cute thank you card, and now whenever I want to do a creative project, I have all the supplies I need. I am really into “foldables” and posters and “projects-in-a-day,” and now I have all the card stock, markers and glue I need so that my students can actually make quality projects. I asked for a bunch of mechanical pencils, so now I don’t stress out when someone doesn’t have a pencil; I just give them one and they don’t even need to waste time sharpening it. We love the box of fine tip markers, and my 6th graders use them often for “Rainbow Reading” (blog post on that activity to come!) and for editing each others’ papers. We love Reddit and nice people who donate school supplies!